Crime fiction that elucidates the realities of the society in which it is set can often be a very powerful and enlightening reading experience. Typically, this translates into a very dark and depressing style, but in the case of Dear Daughter by Elizabeth Little, the tone is decidedly less somber, but no less spot on in its highlighting of cultural mores. Dear Daughter is the story of Janie Jenkins – a socialite who served time for killing her own mother; a crime she has no memory of committing. Released due to a technicality, Janie finds herself thrust into a changed world – after all, ten years is a long time to be isolated from society. One thing that has not changed is the public’s interest in Janie Jenkins. In fact, with the increased role of tabloid journalism and society’s need to create a cult of celebrity, Janie Jenkins is the topic du jour. This is a role that Janie wants no part of. What she wants to do is find out what happened the night her mother died and come to terms with the possibility that maybe she did in fact, kill her. Elizabeth Little has created a character in Janie Jenkins who is not exactly easy to like. Part of this is because Janie doesn’t really like herself. Little really gives the reader a sense of what it would be like to return to a society after missing out on some seismic changes. When Janie went to prison, the Internet, social media, paparazzi and celebrity worship were nowhere near as important and influential as they are today. As readers watch her navigate this new existence, it’s impossible not to feel sympathy for Janie. Upon release, Janie follows clues that lead her deep into her mother’s past – a history she never knew existed. Janie encounters both friend and foe on her journey, never really knowing which is which. Her investigation takes her to a remote town in South Dakota and there she begins to unravel the tangled web of lies that was her mother’s life. All the while, trying to evade the media spotlight. Elizabeth Little wisely chooses to alternate the standard narrative chapters with ephemera from the journalistic world. Everything from blog posts to excerpts from true crime books; from court documents to text messages; from newspaper clippings to interview quotes are used to highlight how all-consuming the media focus on Janie Jenkins and her story has become. Ultimately, it may just be this spotlight, which proves to be Janie’s salvation. Like any level of notoriety, it comes with both its positive and negative aspects. Can Janie find a balance? And will be she able to live with herself once she finds out the truth? 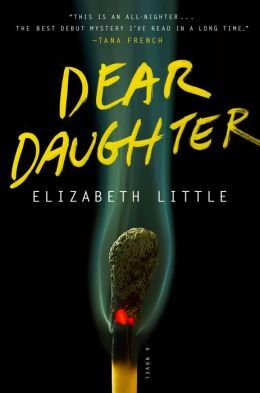 Dear Daughter is a debut novel for Elizabeth Little and while it may have been just a bit longer than necessary, it heralds the arrival of a new talent on the crime fiction scene – one who is sure to be around for a long while. The writing feels fresh and modern, fitting for a story the focuses on the nature of celebrity. Readers will look forward to seeing what Elizabeth Little has planned for her next novel.